Platinum Resistance Thermometers Detectors (RTDs) rely on the fact that platinum, like many other metals, exhibits increased electrical resistance as temperature rises. For example, a conventional RTD designed to provide 100 Ohms at 0 °C has a resistance in the neighborhood of 80 Ohms at -50 °C and 120 Ohms at 50 °C, or a sensitivity of about 0.4 Ohms per degree. RTDs constructed to particularly exacting specifications, termed Standard Platinum Resistance Thermometers, are named as the defining measurement tools for interpolating temperatures under ITS-90. In general, RTDs can have high accuracy (0.01 °C), stability, and repeatability across a wide range of temperatures from -200 °C to 500 °C. 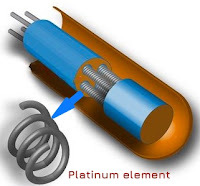 Typically the platinum element is formed into thick or thin films, or the platinum wire is arranged in two, three or four helical coils (see diagram, right) – the more coils, the higher the sensitivity. The film or wire is placed inside a glass or ceramic enclosure, and can be supported by loose or compacted MgO. Platinum-based leads connect the probe unit to the thermometer electronics, which convert the electrical signal to temperature. RTDs are broadly divided into two groups: Industrial RTDs and Standard Platinum Resistance Thermometers, depending on sensitivity and robustness. ASTM and IEC define several classes of RTDs, each with a different set of specifications. An ASTM "Class A" unit, for example, has an out-of-the-box tolerance — maximum permissible error — that ranges from 0.47 °C at -200 °C to 0.13 °C at 0 °C to 0.98 °C at 500 °C. Resistance-temperature relationship is well characterized. Can be used with a digital temperature read-out device. Mechanical shock and vibration will cause drift. 2-and 3-wire devices need lead-wire compensation. Non-hermetically sealed RTDs will deteriorate in environments with excessive moisture. Post abstracted from "Mercury Thermometer Alternatives: Platinum Resistance Thermometers (PRTs)" by NIST. Never Forget. We Salute Our Veterans.